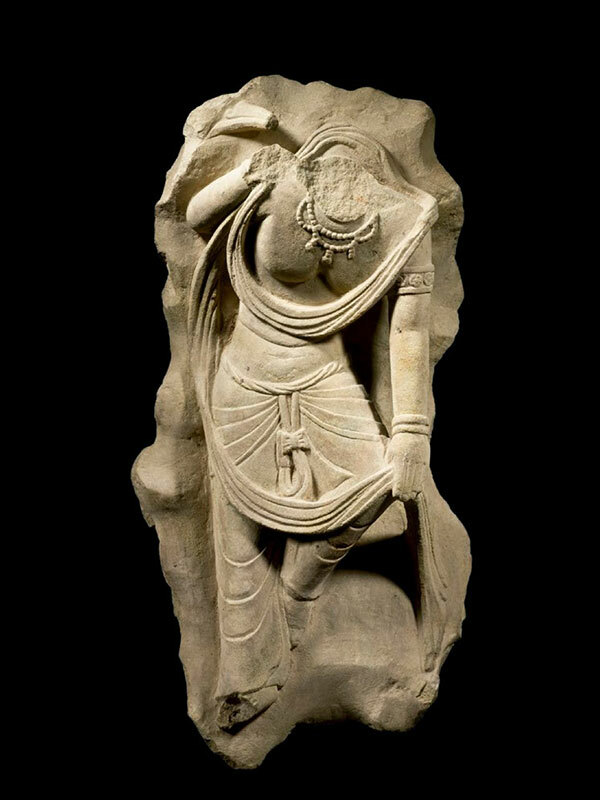 A sandstone torso of a bodhisattva, the elegant, sinuously posed body clad in a diaphanous, pleated skirt, which gracefully clings tightly to the hips and legs and is held together at the waist by a knotted belt with pendant loops and bows. A long, trailing scarf is looped behind and in front of the figure. At the front, the lower loop is held in the figure’s left hand, which rests on the half-raised knee. An elaborate necklace with swags and pendants encircles the neck, and the left arm is adorned with an armlet and a bracelet. This sinuous, almost playfully posed torso of a bodhisattva (a being who has attained enlightenment, but chooses to remain in the world to assist mankind) most probably originally formed part of a stele depicting two such figures, flanking a central Buddha. It clearly shows the strong influence of the Indian Gupta period on Chinese Buddhist sculpture. The tribhanga (‘triple-bent’) posture, the diaphanous clothes (dhoti) and elaborate jewellery (keyura) all betray an Indian influence. The fluid, free style of carving is indicative of the greater sense of relaxation and movement prevalent in Tang China. Stylistically, the type of carving and the general style of this bodhisattva resemble sculpture from the cave temples in Tianlongshan, Shanxi province. Three sandstone torsos of bodhisattva of closely comparable style, dated to the 8th century, were originally located at the Tianlongshan: two larger figures, originally from the East Wall of Cave XXI as companions of a central Buddha, are now respectively in the Avery Brundage collection at the Asian Art Museum of San Francisco and the Bigelow collection at the Museum of Fine Arts Boston. Another torso of similar size is in the Eugene Fuller Memorial collection at the Seattle Art Museum. A further comparable 8th century white marble torso of bodhisattva, unearthed from the old precincts of the imperial Daming Gong (‘Palace of Great Brightness’, the main imperial residence during 663-880s), is now in the collection of the Xian Beilin Museum.